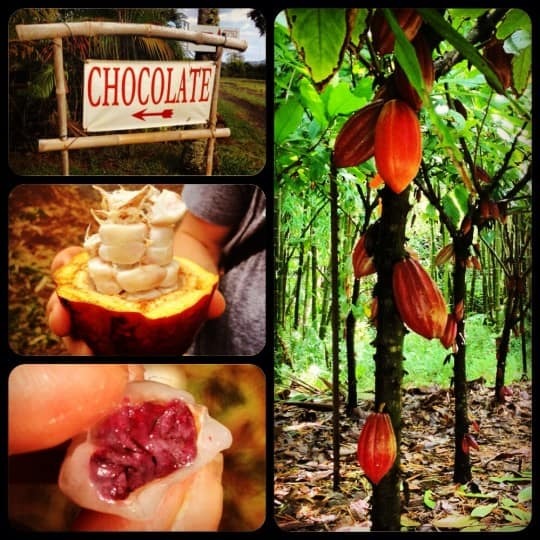 A while back, I went on a chocolate farm tour in Hawaii. I was STOKED, as I am certainly a chocolate lover! The tour, at Steelgrass Farms in Kauai, was amazing! Not only did we taste 11, yes 11, different types of dark chocolate, but we also tasted a ton of tropical fruits native to the islands. I think there’s a misconception about chocolate and whether or not it’s good for you, so I’d like to clear that up today. Antioxidant: A study here showed that cacao had higher antioxidant values than blueberries or acai berries! Magnesium: Ever wonder why girls sometimes crave chocolate around that time of the month? Chocolate is an excellent source of magnesium, which is a muscle relaxant, therefore helping ease the possible cramps associated with menstruating. Flavanoids: There are multiple studies showing that the flavanoids in dark chocolate can help lower blood pressure and risk of heart disease. A couple of those studies are quoted here. You want to avoid chocolate with milk products, and artificial colour/flavours or other additives, as you then lose a lot of the health benefits of chocolate. So there you have it! Chocolate ain’t all bad, so go ahead and indulge a little! What are your favourite brands of healthy dark chocolate?